Just as the name implies, these bars arecream-filled brownies iced with a chocolate glaze and garnishedwith sliced almonds. Heat oven to 350°F (175°C). Line15 1/2 x 10 1/2 x 1-inch jelly roll pan with foil; grease foil. 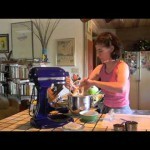 Melt butter in small saucepan; removefrom heat. Stir in cocoa until smooth. Beat eggs in medium bowl; gradually addsugar, beating until fluffy. Stir together flour, baking powder andsalt; add to egg mixture. Add cocoa mixture and vanilla; beatwell. Stir in 1 cup chopped nuts. Spread batter into preparedpan. Bake 12 to 14 minutes or until top springsback when touched lightly in center. Cool completely in pan onwire rack; remove from pan to cutting board. Remove foil; cutbrownie in half crosswise. Prepare Cream Filling: Beat cream cheese,butter and 1 teaspoon vanilla in small bowl. Gradually add powderedsugar, beating until of spreading consistency. Spread one half of brownie with filling;top with second half of brownie. Prepare Chocolate Glaze: In small saucepan,heat sugar and water to boiling. Remove from heat. Immediatelyadd chocolate chips, stirring until melted.Spread glaze overtop; sprinkle with almonds, if desired. Allow to glaze to set and cut into bars. 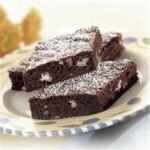 If the Cream-Filled Brownies recipe was useful and interesting, you can share it with your friends or leave a comment.